Mom's "Day From ..." yesterday wasn't as bad as she had expected. It is still going to be a very busy week, but she should be fine. I've tried to make sure she gets enough rest. Heck, I found a book for her to read about a cat detective named Joe Grey. (Really. The detective is a grey cat named Joe.) Mom duly sat herself down on the couch last night and read the whole thing. 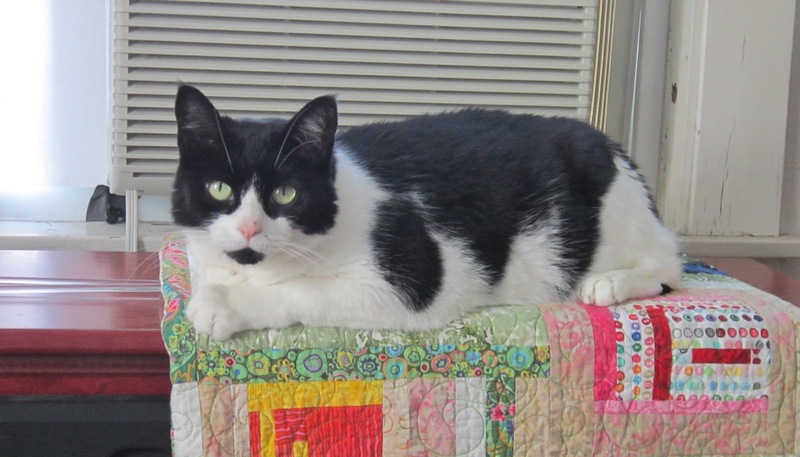 The quilt on which I am resting belongs to ME and was made for ME by a famous quilter. Quilts are great for napping on, and covering with your furs, but there's nothing like one that is made specially for YOU. Or ME, as the case may be. 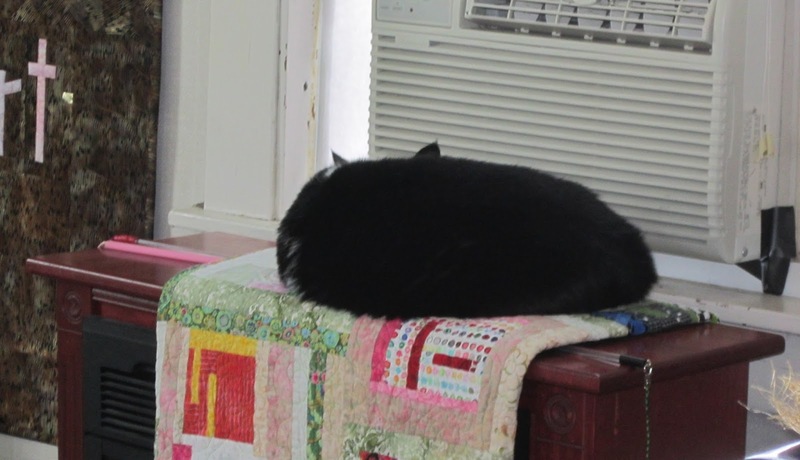 Mom says this photo is unusual because I don't usually sleep with my back to the room. Usually I like to see what might come at me. So I've been snoozing, and Mom has been doing whatever she wants. Which isn't much. She said Friday was worse than Thursday and that Monday will be a real H-E double hockeysticks kind of a day. She isn't looking forward to it. Mom's had a rough week. Tuesday and Wednesday were bad enough, she said, but Thursday was the worst. She said there was a port that wasn't happy so it kept throwing up errors. When it did that the switch it was living on got sick and died, and made the two next-door switches sick too. Then all three threw up errors and the Big Daddy switch shut all three of them down. I think this sounds suspiciously like a make believe story, except Mom says it isn't. When the three switches took naps, half the people at her day-hunting gig couldn't work on their computers, because the computers need the switches to talk to the servants. A sultan had to drive up from Mass and find the bad port and move the blue spaghetti that was living there to a new home. It took him two hours to find it. Then a Mister Cam got sick and backed up production. Mom wanted to blast herself to Bermuda to escape. I don't get it? What's Bermuda? Then Mom had to make a trip to a vendor after day hunting to celebrate a their home. That was fun, but Mom got caught in a downpour on the way home and she says driving was dicey. Then when she got close to home there was an accident in the road that had traffic backed up for miles and miles. Fortunately Mom got off two exits early and got home the back way. She almost missed the first two episodes of the new season of Project Runway, but she didn't. She made herself dinner (after I got my foods), and then sacked out on the couch. Mom says the weekend better be quiet and uneventful. She says she isn't going ANYWHERE, and she might not even answer the telephone. Oh and NEXT WEEK? Mom just shakes her head closes her eyes when she thinks about it. 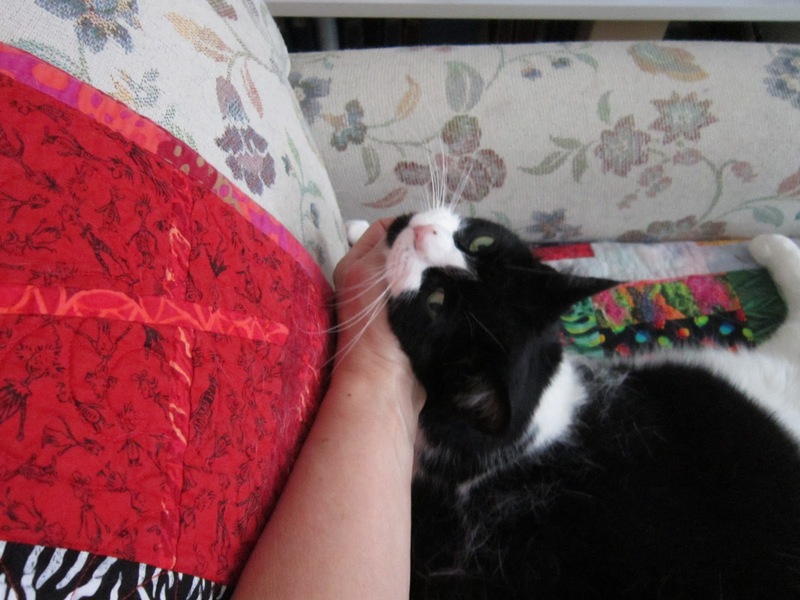 Geez, if I was a lap-napping kitty, I'd have a very busy weekend trying to de-stress Mom. I think she needs some 'Nip. Well, maybe not. Maybe I'll get her some chocolate instead. PS, Yoda had his boy bits snipped last week. Mr Karate told Mom he came back from the v-e-t and walked around like a drunken sailor, bumping into things. I almost feel sorry for the kit. Today is Mim-may's birthday. I can't tell you how old she is, but it's a big number, and it has an "0" in it. Here is Mim-may eating the lunch Mom made when they visited the Flume on Monday. Mim-may loves Mom's cooking, as you can see. 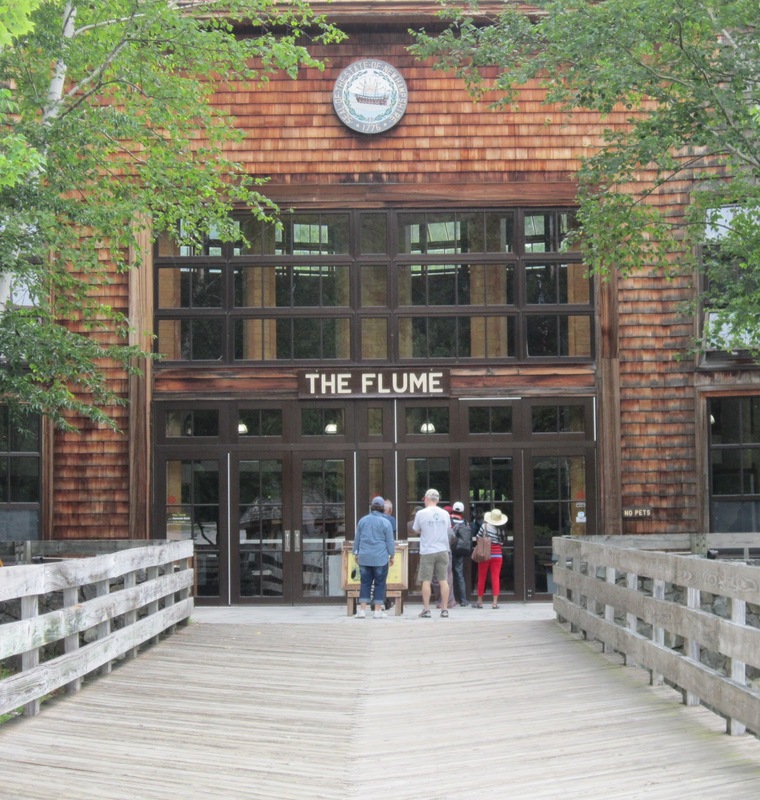 Mom and Mim-may brought PlusOne and Pretty Girl to the Flume yesterday. It's a gorge hidden in the White Mountains in northern New Hampster. Mom says it is really cool, but I think it looks too wet to be much fun. After they all had lunch, they went up to the top of Cannon Mountain. by riding in a tramway car suspended from wires. You can see a red one in the picture above. While they were waiting to go up, they saw a Black bear and her two cubs. Mom couldn't get a picture of all three of them, because they kept going under the bushes, but on the way to the top, Mom got a good picture of the Momma Bear. they were in the clouds, and the clouds covered everything. On the other hand, PlusOne kept everybody entertained. 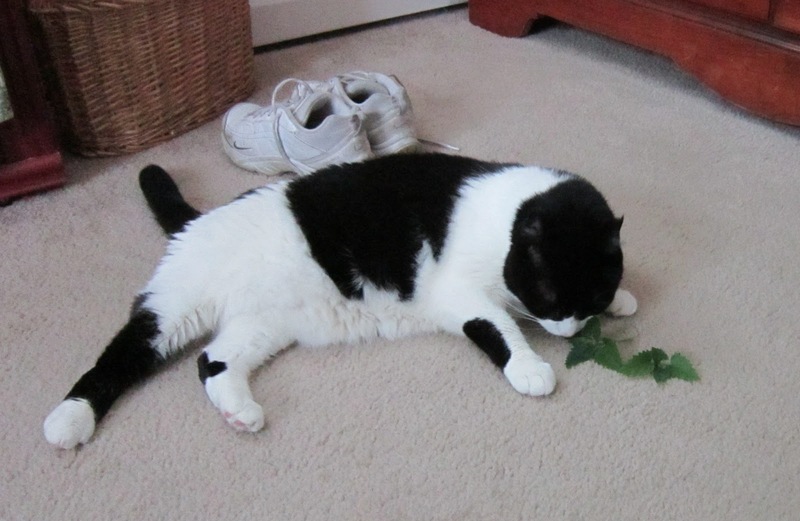 and indulging in some of my fresh 'Nip. The Pretty Girl is visiting from Oregon. Naturally, photographs had to be taken with PlusOne, who is six months older. Naturally, kids have to show off. Naturally, fun must be had. It's Mom's birthday, so I got her a boo-kay of Nasturtiums because they smell nice and are pretty to look at. 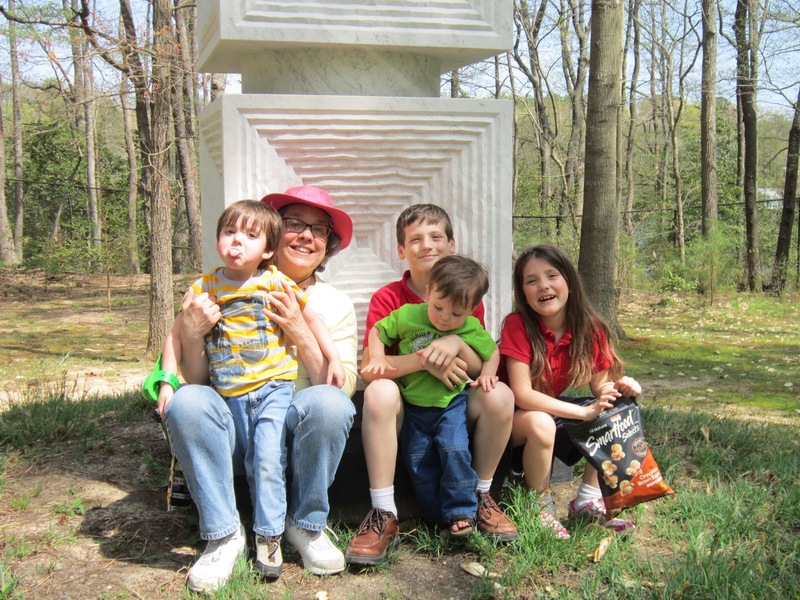 Mom usually takes all the pictures, so she isn't actually in any of them, but here she is with our Maryland fambly. And here I am, because you all want to see a picture of me in every post. Happy Birthday Mom! I love you very much, and am very lucky to have you as my Mom. As long as we are going through old photos, here's one to show that I can show little Yoda a thing or two about flexibility. This was taken in August of 2007. The HOTS are still here, and today is supposed to be super duper, almost triple-digit HOT. OK everybody, Mom and I prefer to post photos that were taken within days of the blog post. We don't like using the same old photos over and over again. But since you asked, here's a photo of me from March of 2007. I wasn't even one year old. 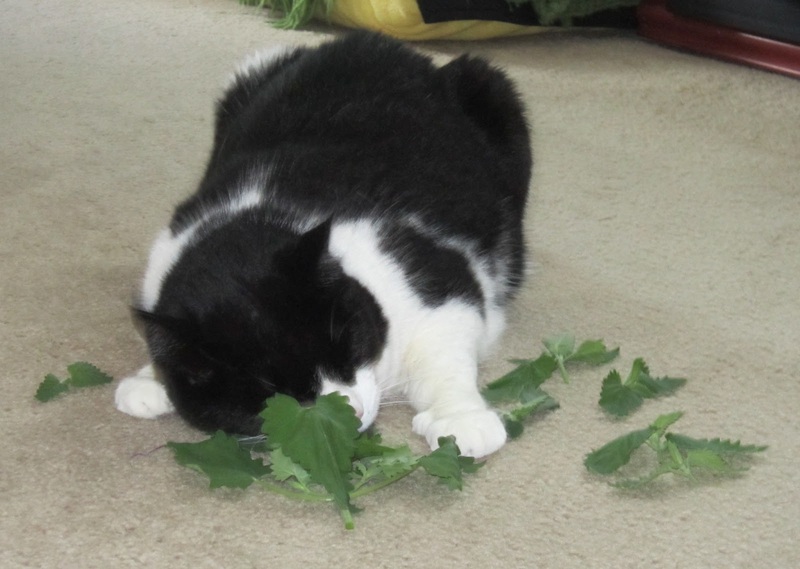 Mom brought me more sprigs of 'Nip this morning, and it is still HOT. Mom has her nose in a book and I don't think she'll pull it out until she is finished reading it. It is a 650 page monster by Elizabeth George. Mom's not too particularly impressed with it, but she is sticking with it because she wants to see how all the pieces fit together at the end. Which is why you are looking at a picture of Yoda, and not me. After Mom got dressed this morning she went outside to water her garden. 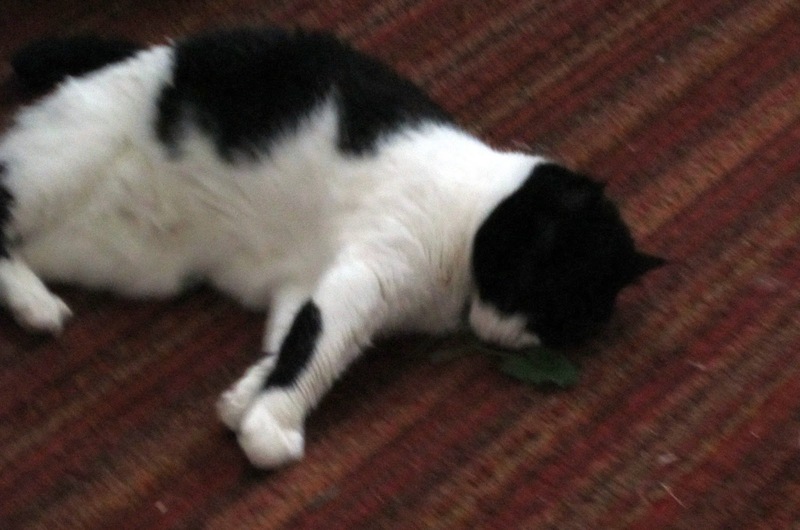 When she came back in she brought me two sprigs of fresh 'Nip! Oh, it's a wonderful day. Yup, we got the hots, and as you can see, they are going to be here for a while. Three consecutive days of 90+ temps means we have a heat wave. I'll be hiding out under the bed where it's cooler. This is my 'Nip plant. Actually, there are several plants in this one pot. Mom has trimmed the tops of the plants so they will get bushier. Mom was very generous with the bits she clipped off, as you can see. Yup, my Mom is pretty terrific. Oh yeah. It's a spectacular Sunday. No matter where I hide I have to come out to eat. Mom says we should be grateful it rains around here, because so many places aren't getting any and they are at risk for fires. I know she means well but I'm beginning to feel a bit waterlogged. Every day this week we have had sudden downpours, and then fifteen minutes later it stops and the sun comes out. The weather liars say it should be sunnier the next few days. I don't even mind it the hots come back if the sun is out. Every night after she gets home from day-hunting Mom has had to tip over her garden pots and let the water run out. She says her some of her basil is suffering, that it's yellowish and spindly. Still, she made a batch of pesto last weekend, so that's good. 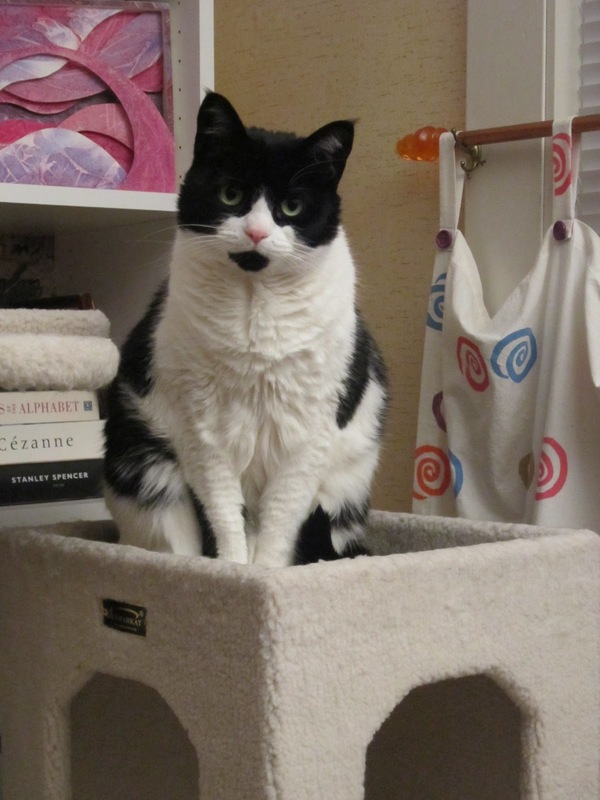 Mom says she's been wrestling with words for her talk in Saint Loo-is later this year, but really, all she's been doing is tippy tapping on her little lapbox. 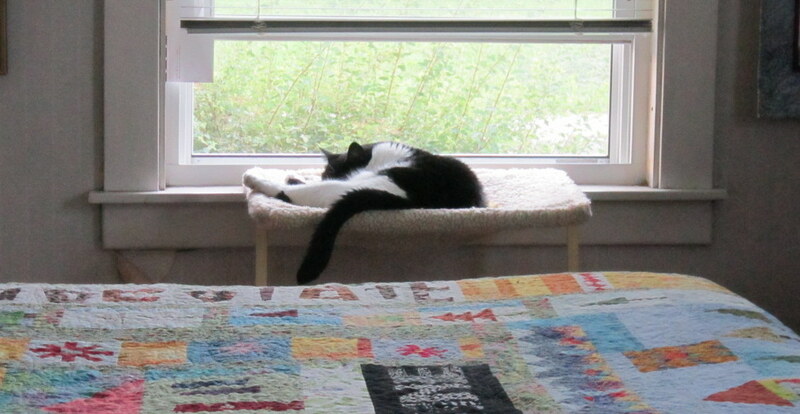 I've been napping in all my cool spots, avoiding the flashy box. 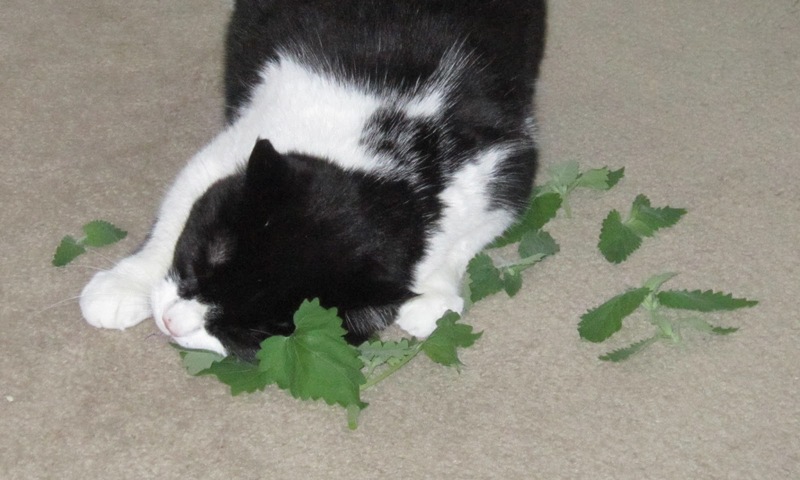 Mom found out last year that although I love dried 'Nip, the fresh stuff is just DIVINE! She cut a bit from my 'Nip plant and gave it to me. I'm ashamed to say I completely lost control. Then Mom thought she would be clever. I may be a CAT, but I am not a STUPID cat. I ain't gettin' in that thing no matter WHAT's in it. It was a busy weekend, and it was hot. 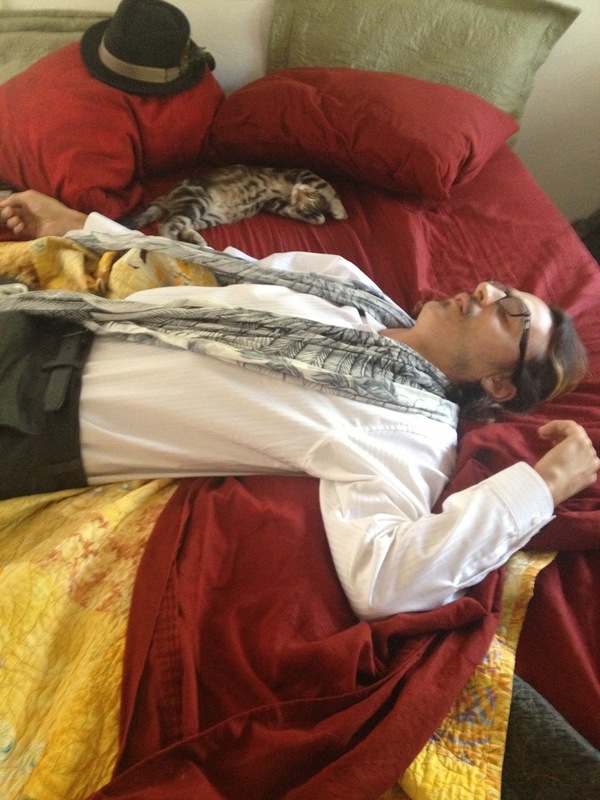 I spent a lot of time napping. From my cat hammock I can see and smell what's outside, as well as keeping out of the sun, so it's a perfect spot for me. 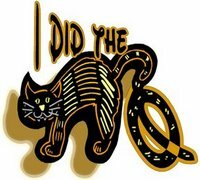 Andy Murray did it! He won Wimbledon!! 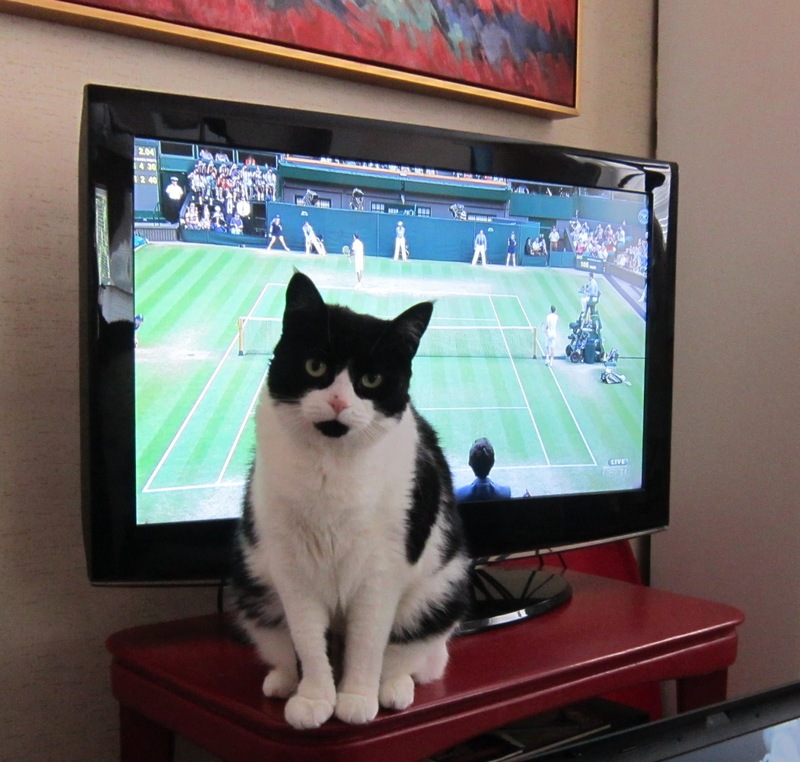 It is the Gentlemen's Final at Wimbledon, and I am watching with Mom. Wild horses couldn't drag me away. 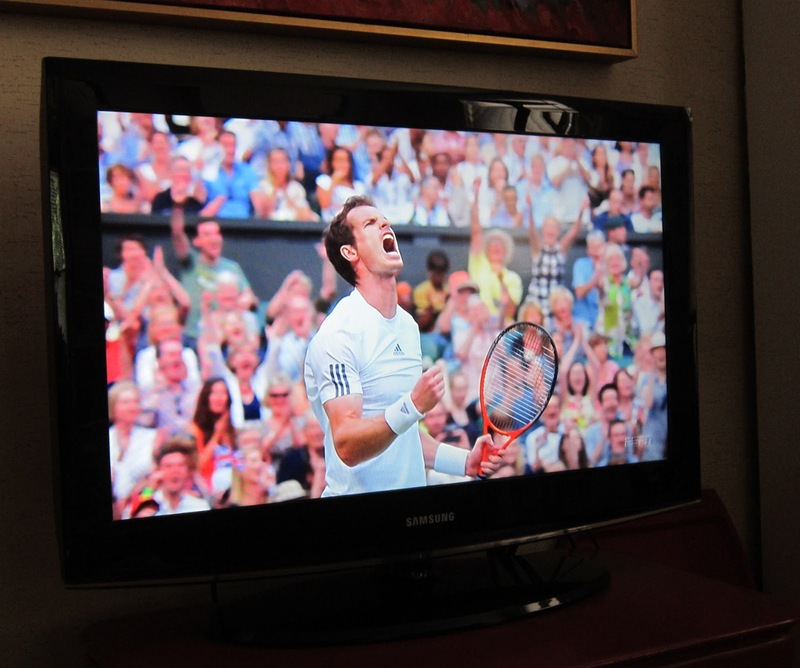 Mom and I are rooting for Andy Murray. I have my paws crossed. It's hot out. 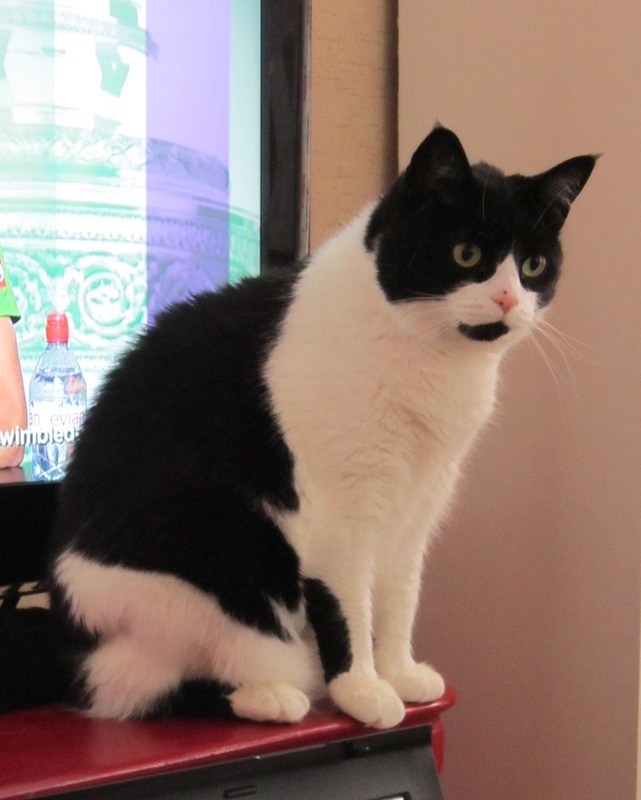 Mom already has the air colditioner running in the living room, and she moved my foods dishes in there so it is more comfortable for me. Somebody asked if we were watching Wimbledon this year. Rubylocks sent Mom this picture of Mr Karate napping with Yoda. I think it makes a perfect Family Friday photo. Me? It's so blasted hot I'm hiding in a cool spot. Mom even has a fan going just for me. Happy Fourth of July! Happy Independence Day, USA! 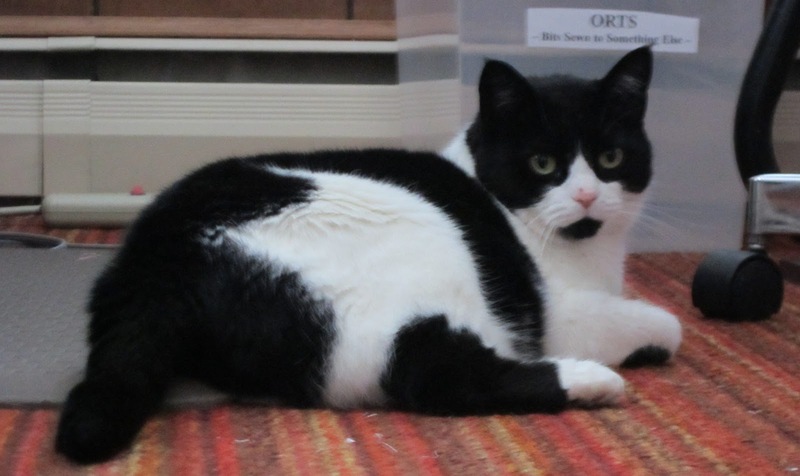 I hid under the bed last night when all the sparky boom-booms exploded last night. Mom has done the dishes and has something cooking in the crooked pot. We have the air colditioners running so we are both trying to stay cool today. Oh. Big news. Sorta. 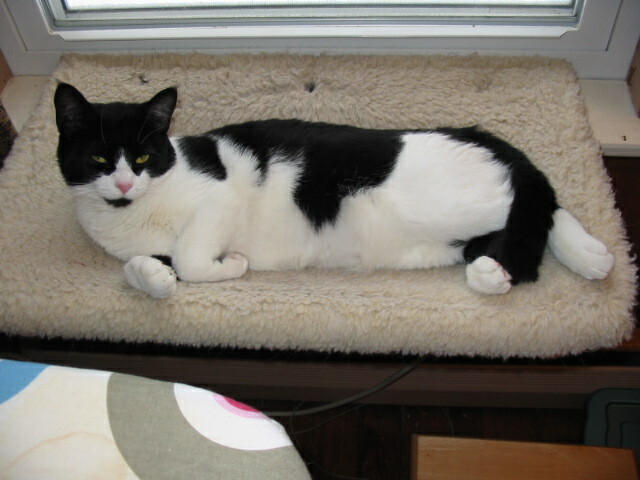 I will get to meet Yoda later this year when Mom and I visit Mr Karate and Rubylocks. It's been raining here every day for the last several days. Sure the sun comes out for a bit, but then it goes away and we get heavy rain and lots of cracks and booms. I do not like crack-and-boom-storms, so I hide. When I hide, Mom can't take any pictures of me. So I sent her outside to take a picture of how green and wet everything is. This is what she came back with. It is a boo-kay of the yukky green junk she grows in her garden. Hooman beans. Can't live with 'em. Can't live without 'em. It's hot here, but nowhere near as hot as it is out west. Here it's sticky, and that's very uncomfortable. The weather guys say it will be like this most of the week. 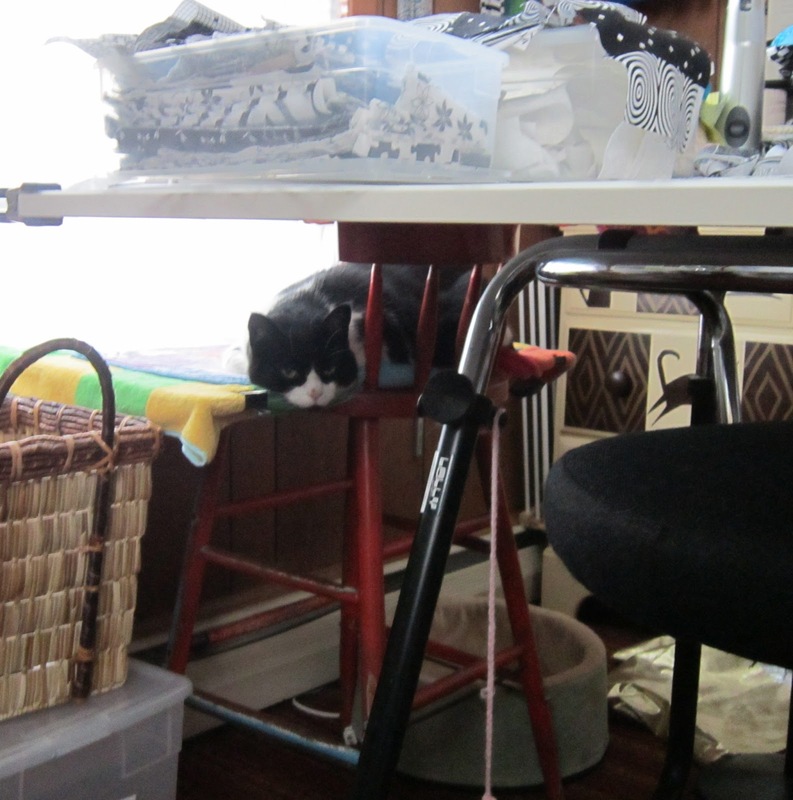 It's a good thing I have lots of cool places to nap.